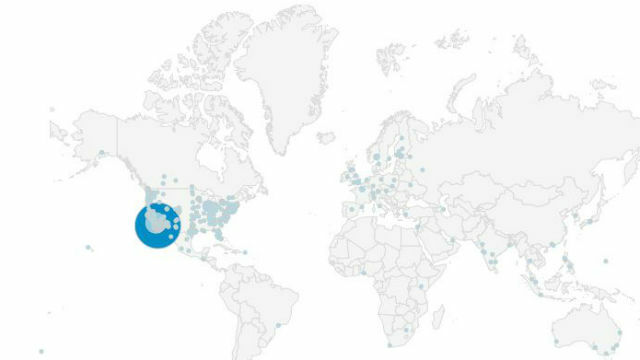 Chart from Google Analytics shows the geographic spread of Times of Sand Diego’s readership in January. Times of San Diego began 2019 with a major increase in readership, recording 288,573 unique users in January — a 51 percent jump from the same month last year. The independent local news website’s readers continued to be young, mobile and local as the new year began. Readers aged 18 to 44 accounted for 43 percent of reading sessions in January, according to Google Analytics. That’s a considerably larger share than for traditional print and broadcast media. The mobile share of traffic continued to rise, with 61 percent of reading sessions in January on smartphones. The website uses responsive design to adapt to different size screens, and also formats content for the web’s increasingly popular Accelerated Mobile Pages initiative. The Internet is global, but Times of San Diego remains very local. Readers in the City of San Diego accounted for 34 percent of sessions, while another 16 percent were elsewhere in San Diego County and another 11 percent elsewhere in Southern California. The remaining 39 percent were national and even international, primarily because of the website’s military, business and politics coverage. Times of San Diego’s mission continues to be providing accurate, comprehensive and fair coverage of the major San Diego news developments. The website’s staff of six contributing editors and photographers and numerous freelancers published 597 articles in January — an average of 19 daily. We believe freely available local news is crucial to democracy at the local level. So there’s no “paywall,” and no subscription is required. Instead, Times of San Diego is supported by local and national advertising, and by contributions from readers. If you like our work, please consider a small monthly contribution of a few dollars. We’re partnered with PressPatron to make this easy. Click the red button above or visit our support page. And if you haven’t signed up for our free email newsletter, which is delivers top headlines at 8 a.m. daily, click here to securely enter your email address.